You Call it Legacy. I Call it Production. The IT world is moving fast according to the pundits. You may read the latest round of articles that tell you about microservices and cloud-first, or cloud-only organizations who are using development strategies to embrace DevOps and the inevitable shift towards next-generation platforms. Containers, clouds, microservices, DevOps, Serverless…and Legacy! Tired of buzzword bingo? You’re not alone. One of the most common themes that we see among many of those who are pushing us toward the next platforms is that we keep hearing about “legacy IT”. The word legacy is thrown around as if we are supposed to feel bad that it is still here. The reality is that what most leading edge pundits call legacy, is what 90+% of organizations call production. As a firm believer in leaning forward, I may even be accused of being a little too far over my skis as some like to say. What I make a point of doing is keeping a foot firmly planted in today’s infrastructure at the same time that I have the other foot on the path to something new and unknown. It’s an important tactic that we all need to embrace IMHO. Don’t even get me started on bimodal. Ok, I’ll get started myself. Much of the punditry in our industry has landed on this concept of bimodal IT. What’s frightening to me is that it’s being treated as if it is new and that because it was given a name, that a consulting company is needed to help you understand it and get through it. We’ve been bimodal since the 1970s. When we roll one off of the bottom, it will inevitably be replaced by one at the top. Technically, there are six forms of real IT-based content in the list, but I would rather not call it Sexamodal because that just sounds creepy. The more that we try to move forward, the more we tend to create abstractions to reduce the friction of interacting with the previous generations of IT systems. This is a great enabler for us to be able to keep the data and systems where they excel. Why should you move all of your data out of a distributed system into a web-based, cloud-native architecture when the cost to do so would far exceed the value gotten from the refactoring. Make sure that you understand the real business requirements of the current systems before we race to replace them. Any decision around technology that is not made in the context of a business requirement will lead to costs and frustration. Plus, before we go around tagging everything as legacy as if it is a bad thing, remember that it is keeping your business alive. Yes, that is bipartisan, not bimodal. For some reason I have always been torn on the term bimodal IT. Gartner has been using this term heavily in the last 12-18 months, and we can see that it has obviously been resonating. I fought the term for a long time because it felt like it didn’t capture the real essence of the challenge that is happening inside IT organizations. The phrase was bothersome for some reason because, to me, it felt like it was too much of a generalization. I’ve had my issues with gross generalizations made by analysts because they tend to be like horoscopes such as “you will find that someone says something to you today that is meaningful”, and of course, you take something that happens and apply to the horoscope as if the horoscope was the true predictor. I have lots of friends at analyst firms, so I’ll end my rant there to not sound jaded. Bimodal anything is the necessity. You can’t suddenly swing from one methodology to the other. There is always a state of transition, so the phrase bimodal seemed about as visionary as when people say “at the end of the day”. So, how is bimodal IT going? They may seem polarizing, and believe me that if you post one of those, you will very quickly see which of your Twitter followers land on which side of the public cloud versus private cloud argument. We saw the same resistance as we moved from centralized computing on the mainframe and distributed computing came along. At first, it was seen as a fad. Once it began to take hold, it was recognized that it will coexist with the traditional mainframe model. Distributed computing advocates began predicting the end of the mainframe era. Mainframe advocates held onto the opinion that the data was in the mainframe, and thus was immovable. The tug-o-war continued and today we see that many large organizations still fully embrace both types of computing platforms. To be honest, mainframe versus distributed was probably the first of the bimodal IT examples. Predicting that bimodal IT is the future is effectively like predicting that evolution is the future. It’s a given, not a visionary statement. I pride myself on seeing both sides of every argument. It’s important as an architect to understand both the “Why?” and “Why not?” of every architectural and technology decision we make. Business relies on understanding how it will win, and how it may lose as it undertakes any strategy. I’m not saying that I’m right, but I do see both sides which each think that they are right. 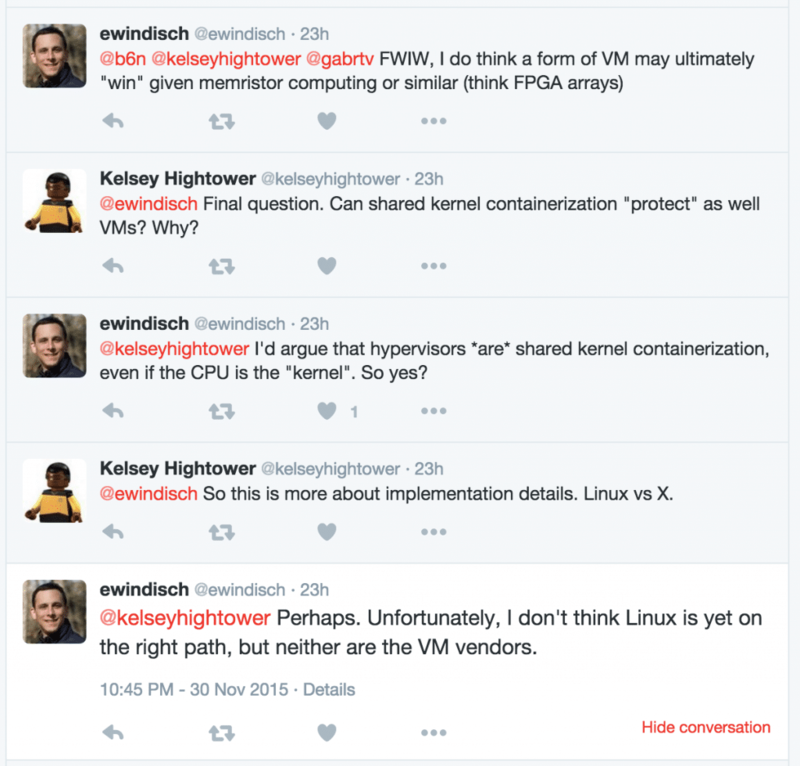 Recently I have seen a lot of activity around whether containers on VMs is a direction that should be embraced. It has it’s pros and cons, and I wrote about some of my thoughts on it here. Another classic challenge we have with technology discussions is that we often latch onto facts that can expire. You may recall the famous Bill Gates quote “640K ought to be enough for anyone”, which was actually not a direct quote, and was also a statement that was correct in its time. Then the questions showed up on Twitter, with much more of a visceral reaction from either side of the discussion. When I say things like containers on VMs is good for now because of challenges with container security, it isn’t that containers can’t be secured. It just means that in today’s IT practices, most organizations have stronger security practices (if any) wrapped around virtual machines. This gives a potential logical boundary to apply policy in the absence of strong, secure, development practices on containers. In the same way that political rhetoric is divisive, yet actual political practice doesn’t actually make sudden wild shifts, IT is going through the same challenge. While the pundits (me included) are talking about what’s coming down the road, we are still seeing organizations who are just beginning to fully embrace virtualization. AWS versus Azure. Rocket versus Docker. Containers versus VMs. Java versus Ruby. You name the subject, and there is a vocal group who will outwardly question your decisions to adopt whatever it is that you are choosing to adopt. The end result is that we will be running these technologies in small bits, and before we know it we will have adopted them despite are resistance in either direction. Stop calling it Shadow IT. It is just IT. Bimodal is already true, and it will remain a partisan position challenge for years to come. Buckle up and enjoy the ride.